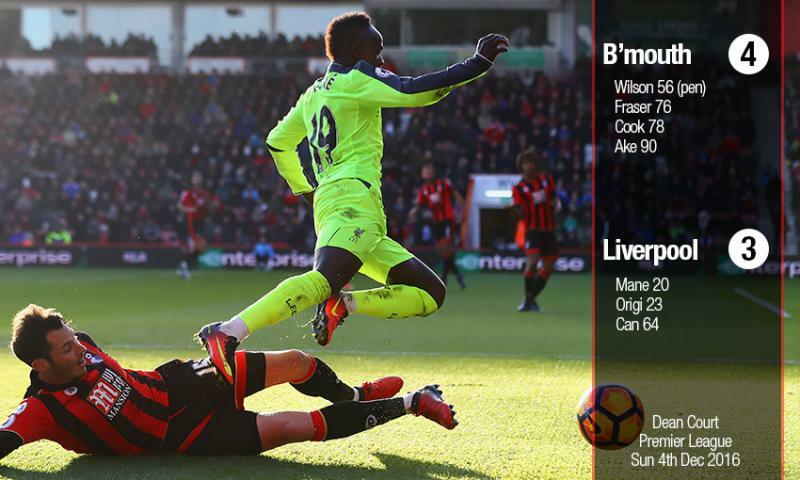 Following Liverpool's thrilling Champions League exploits in midweek, focus shifts back to the Premier League as Bournemouth check in at Anfield on Saturday. Jürgen Klopp secured his first ever win as Reds manager against the Cherries back in 2015 and there have been 18 goals shared between the sides in meetings since then. But how have the Reds fared in their last five clashes with the south coast club? 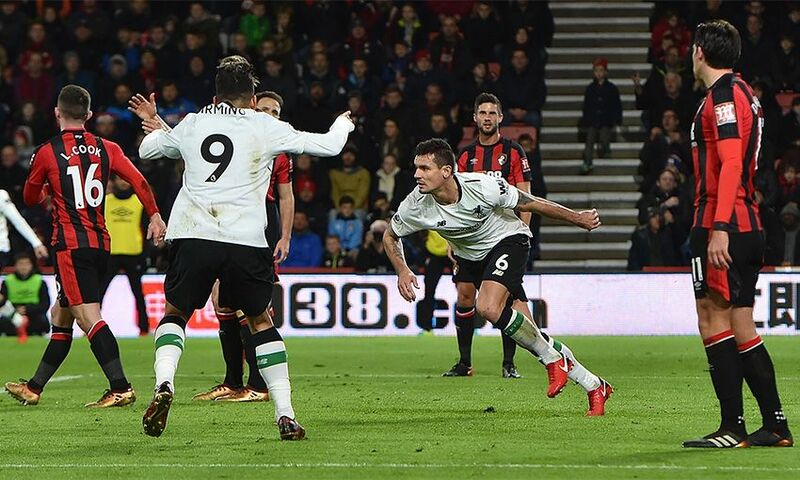 Liverpool tore through Bournemouth with a ruthless attacking display at the Vitality Stadium as the Reds became the first team in the history of the English top-flight to win four consecutive away games by a margin of at least three goals. After losing against Tottenham Hotspur at Wembley, Jürgen Klopp's side had beaten West Ham United (4-1), Stoke City (3-0) and Brighton Hove Albion (5-1) on the road across a 12-match unbeaten run that had served up 37 goals. 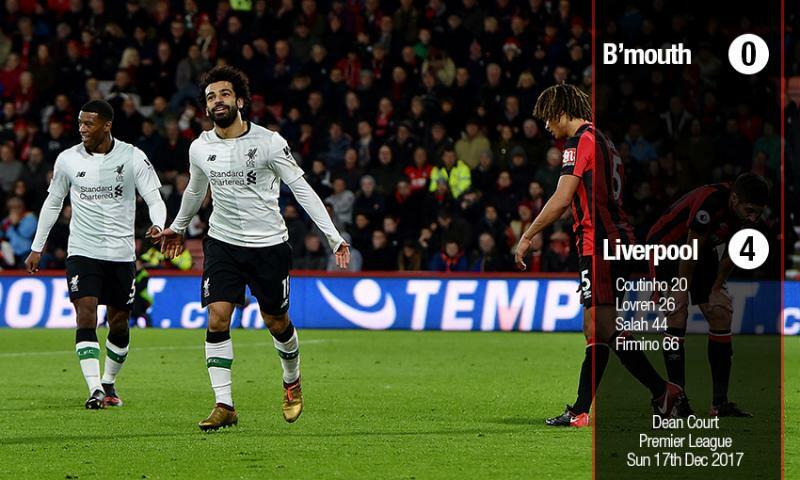 In this south-coast clash, prolific forward Mohamed Salah netted LFC's third goal to become the first Premier League player to score 20 in all competitions during the 2017-18 season ... and he wouldn't stop there. Liverpool equalled the previous season's points tally of 60 with seven games of the Premier League campaign still to play, but this draw felt a bit like a defeat following Josh King's 87th-minute equaliser at Anfield. Philippe Coutinho cancelled out Benik Afobe's opener to become the joint-highest Brazilian goalscorer in Premier League history (level on 29 with Juninho) before Divock Origi headed the Reds in front with his 10th strike of the season. 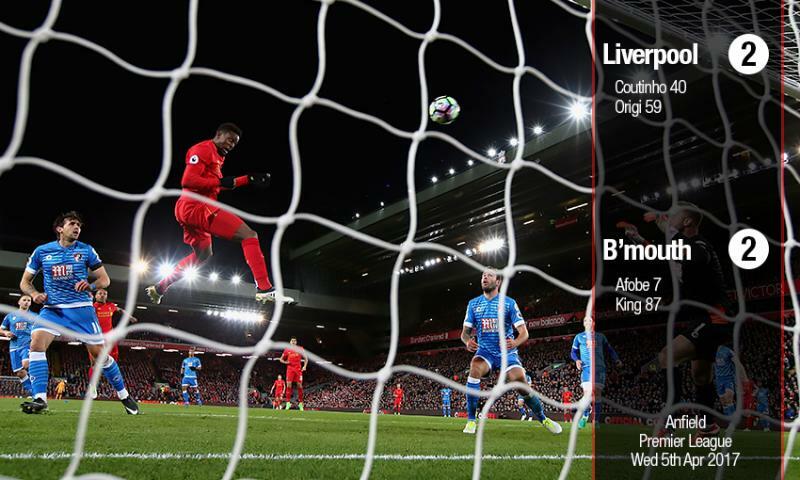 But King's equaliser, from Steve Cook's long throw, left fans ruing Liverpool's season-long issues defending set pieces. This was one of the comebacks of the season. 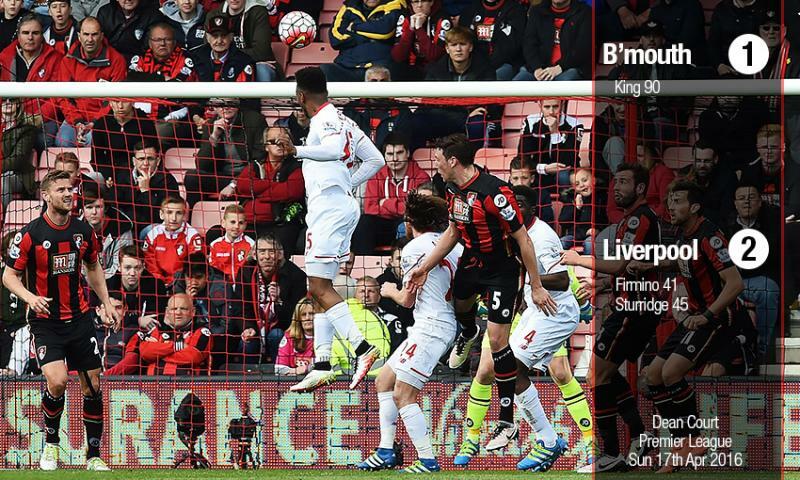 Unfortunately, Liverpool were the victims as Bournemouth claimed a first ever win against the Reds. "It's a wonderful story if you're not part of it on the wrong side," said Klopp following an enthralling match. On the plus side, Sadio Mane continued his excellent form to net the opener and take his league tally to seven goals on his debut season for the Reds. Only two players had scored more for Liverpool in their first 13 Premier League games - Robbie Fowler (8) and Daniel Sturridge (10). Goalkeeper Danny Ward was handed his debut in this one as Klopp made 10 changes to the side that had secured an unforgettable Europa League victory over Borussia Dortmund just days earlier. The victory meant Liverpool had won away at 50 different grounds in the Premier League - more than any other side. 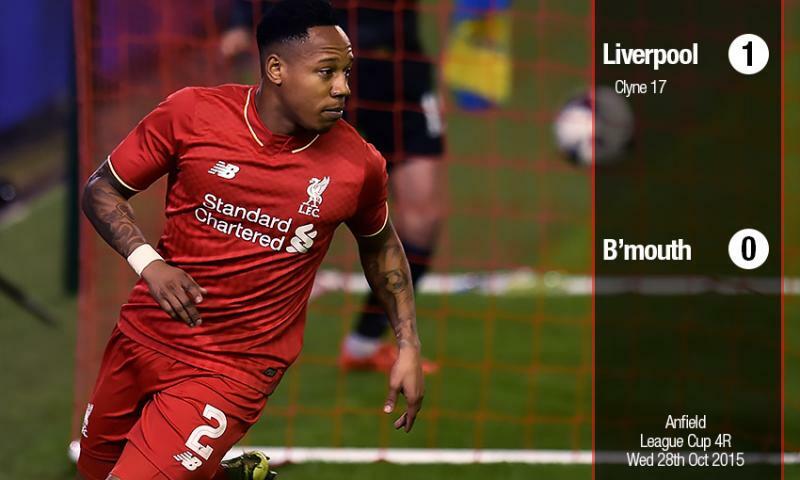 Nathaniel Clyne scored his first goal for Liverpool in this League Cup clash to hand Klopp his maiden win as the new Reds boss. The German, who had drawn his first three matches, said: "We were dominant, played football and got the win we deserved." Joao Teixeira, Connor Randall and Cameron Brannagan all made full debuts in a youthful LFC XI.